Chop the rhubarb into 5cm pieces and put in a pan with the caster sugar, orange juice and zest and the split vanilla pod. Add water to just below the level of the rhubarb. Warm over a low heat, stirring from time to time, until the sugar dissolves, then simmer until the rhubarb is very soft and falling apart. Remove from the heat and cool. Remove the vanilla pod, scrape out the seeds and mix them back in with the rhubarb. Blitz in a food processor until very smooth, or press through a fine plastic sieve. Pour into a plastic container, cover and freeze for at least 6 hours or overnight. About 15 minutes before you want to serve the granita, put it in the fridge to defrost a little. 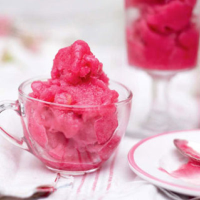 Scrape the granita together with a fork to soften it, then serve in glasses.